Casual, family-friendly seafood dining with indoor/outdoor seating, Intracoastal water-views, amazing sunsets & kids play area - popular locals' spot, serving tasty southern seafood dishes. Nestled under the Baars bridge, Fisherman's corner sits as a favorite of the locals. With a delicious Creole based menu, delightful stuff, and comfy casual atmosphere. 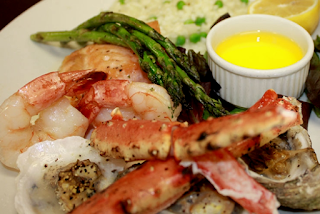 Enjoy the fresh local seafood, dig in to the yummy pastas, and amazing bread pudding. Open daily Fisherman's corner has a magnificent wine and beer selection. Reservations are welcomed. Seafood Restaurant and Oyster Bar. Family oriented and has a playground for kids. Cajun & Creole Restaurant...Best Crawfish in town...Cajun style dishes...Shrimp! Crawfish! Gator! Crab legs! Gumbo! Jambalaya! Red beans&rice! Spice up ya life! Restaurant with Banquet Facilities and Party Planning available. Overlooking Intracoastal Waterway-only one in the area. Beautiful view of boats and Barges passing-view wildlife on shore across from restaurant and playful porpoises attracted by our night time lighting. Varied Menu sure to please any guest. Alfresco, beachfront joint with live music showcasing seafood dishes & bar bites. Lively restaurant, nightclub & bar serving seafood & sushi with music, karaoke & entertainment. Lillian's Pan Pizza is located in Perdido Key in Pensacola and is known as a favorite eating place for locals and tourists alike, Lillian's is one of the best pizza restaurants you'll try! We encourage you to bring the entire family for exceptional dining while enjoying the view and the atmosphere of beautiful Perdido Key beach. The Lost Key Golf Club features a variety of culinary pleasures for the palate while overlooking the beautiful, pristine views of the championship golf course. Fresh local Seafood- Steaks- Chops- Chicken-An Innerarity Point Tradition for over 35 years. Weekends- the South s funniest Bluegrass Band. Where the Locals eat. Full service bar. Great family dining inside or on our deck. Serving fresh friend, blackened, broiled or steamed seafood as well as chicken dishes and burgers. We are steamin' and fryin'! Established location with a good following being taken over by an equally established new owner/operator with a great reputation, great food and very customer oriented. Enjoy sunsets on the water. The Perdido location offers the same menu at the downtown location; steamed & grilled sandwiches, salads & soups. We stock a full line of domestic & imported beers, wine and a full bar with great happy hour prices. Package also available. Live music Friday, Saturday & Sunday. One of the last road houses in America. The Flora-Bama Package and Lounge was established in 1964. Located on the pristine beaches of Perdido Key on the Florida/Alabama line. Entertainment nightly on one of three band stands, starting at 5 pm. For over twenty years Triggers has been providing the area with fresh seafood at a price that’s hard to beat. From their Cajun crawfish Tails to their South Wind steamed Oysters their menu has something for every seafood lover. If you haven’t tried the famous fried cheesecake, you need to visit Triggers! Serves authentic Mexican cuisine-South of the border flavor! Weekly specials. Perdido Key's climate is subtropical, with an average temperature of 75 degrees and 343 days of sunshine, there are a variety of vacation rentals and nearby hotel options. Perdido Key is an unincorporated coastal community in Escambia County Florida, located between Pensacola, Florida and Orange Beach, Alabama - no more than a few hundred yards wide in most places, Perdido Key stretches some 16 miles (26 km) from near Pensacola to Perdido Pass Bridge in Orange Beach. To the south of Perdido Key is the Gulf of Mexico, with its white sand beaches and clear blue waters. North of Perdido Key are Old River and the Intracoastal Waterway. ..